Roughly five months after getting fired from the UFC and FOX for flunking two random drug tests within a matter of four weeks, former UFC middleweight top contender Chael Sonnen (pictured) has been signed by ESPN to become their resident MMA guru. 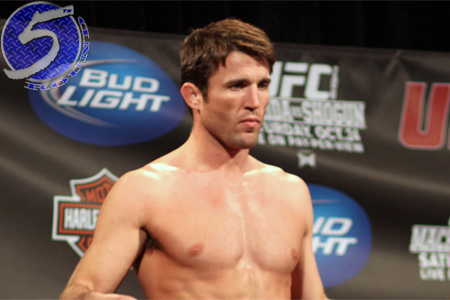 “I love to break down fights,” Sonnen told The Associated Press. “I love to watch them. The fact that ESPN will allow me to do that on the air in a fancy suit and call it a job, it’s what I would be doing at home anyway. Sonnen will debut Friday to assist ESPN with their coverage of UFC 180. The chatty wrestler is expected to appear regularly on “SportsCenter” and other shows on the network. Sonnen was slated to fight Vitor Belfort at UFC 175. The 37-year-old called it quits after his first failed random drug test, which was initially administered in May, revealed he was on exam for Anastrozole and Clomiphene. He subsequently retired from MMA, but not before admitting to also taking human growth hormone. Fast forward one month from then and Sonnen tested positive for hGH, recombinant human erythropoietin (EPO) and human chorionic gonadotropin (hCG). Although Chael P. is regarded as one of the biggest cheaters to ever compete in MMA, he promises to not hide from discussing performance-enhancing drugs as his new analyst role. Prior to joining ESPN, Sonnen served as co-host on Fox Sports 1′s weekly series “UFC Tonight” and is a regular analyst for the UFC’s pre- and post-fight shows. UFC 180 takes place Saturday night inside Arena Ciudad de Mexico in Mexico City. Fabricio Werdum and Mark Hunt battle for the interim heavyweight title in the show’s main event.